Be the first to share your favorite memory, photo or story of Ronna . This memorial page is dedicated for family, friends and future generations to celebrate the life of their loved one. 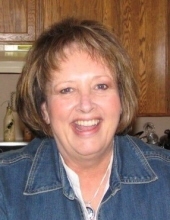 Ronna Lee Pratt, 66, of Post Falls, ID, passed away peacefully with her family by her side on January 28. Her devotion to her family and God supported her through the difficult times preceding her passing. Ronna was born in Aberdeen, South Dakota on October 8, 1952 to Robert Lyman Kirk and Shirley Jean (Kinyon) Watkins. Her journey led her from Aberdeen, SD to Minneapolis, MN, to Everett, WA, to Coeur d’Alene, ID and then to Sandpoint, ID where she graduated High School in 1970. While in Sandpoint, she met the love of her life, Gene. They were married in 1972. Gene’s career took them to Deary/Bovill, ID where they raised their 3 children, and created many lifetime friends and memories. Being outdoors is where she loved to be the most. Camping, gardening, and hunting were her passions in life. She was very proud of her first ever moose, the lush gardens she would create, and the camping trips with her family. Ronna is survived by her husband Wallace (Gene) Pratt, her sons Corey (Sarah) Pratt, Ryan (Lindsey) Pratt, her daughter Casey (Chris) Whallon, her nine Grandchildren Jayda, Nicholas, McKenzie, Braylee, Kylah, Jaycie, Chase, Dawson, Carter, her sister Margaret (Peggy) Kirk, brother Robert Kirk, and her many nieces and nephews. She is preceded in death by her parents and sister Katherine (Kitty) Kirk. A celebration of life will be held at Real Life Ministries 1866 Cecil Rd. Module A. Post Falls, ID on March 2 from 2-5 pm. To send flowers or a remembrance gift to the family of Ronna Lee Pratt, please visit our Tribute Store. "Email Address" would like to share the life celebration of Ronna Lee Pratt. Click on the "link" to go to share a favorite memory or leave a condolence message for the family.